Hello friends! 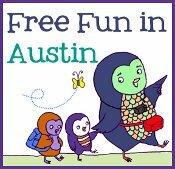 My buddy Heidi was kind enough to ask me to do a guest post over at her fantastic website, Free Fun in Austin. It is all about our experiences as facilitators for Dave Ramsey’s Financial Peace University course. So go check it out! And if you have not “liked” FFIA on Facebook, do it now! If you are here from the FFIA site, welcome! Here is one of my favorite posts about the spiritual applications of head lice. And here is my post about farts. As you can imagine, I am quite a colorful speaker. Thanks for stopping by!